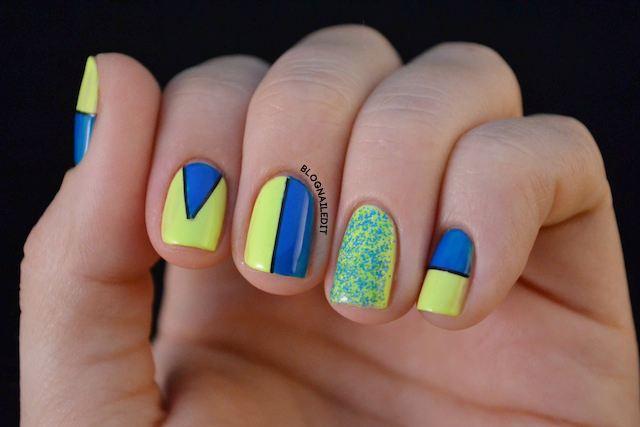 Gotta post before midnight strikes and it's a technical missed day of nail art! I used True Blue (Claire's) and Neon Yellow (Savina) for the majority of this. And who's that? Oh, it's Floam (Nail-Venturous Lacquers). Hard work pays off. I've been trying to score that for a while, and my patience paid off. PS: Don't forget to vote for my submission! This looks great! I love the colors together, and your lines are so good!